Elvis, blue jeans, Abraham Lincoln, plutonium, Slinkys, Frank Sinatra, Cobb salad, Superman, Lucille Ball, e-mail, baseball, Mark Twain, flight, McDonalds, and hundreds of other notable people and things all have birthplaces. Some are gone and marked only by a plaque, but others have been preserved and even transformed into museums. This guidebook is packed with entries on American birthplaces of all sorts, taking travelers state-by-state to a variety of locations. 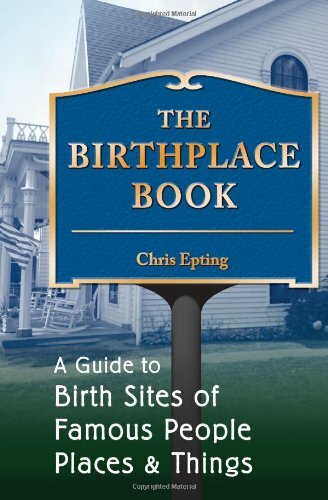 from Stackpole Books (June 7, 2009); titled "The Birthplace Book: A Guide to Birth Sites of Famous People, Places, and Things"
About: More than 380 birthplaces profiled Birthplaces of all 44 presidents Packed with photos of people and places Elvis, blue jeans, Abraham Lincoln, plutonium, Slinkys, Frank Sinatra, Cobb salad, Superman, Lucille Ball, e-mail, baseball, Mark Twain, flight, McDonalds, and hundreds of other notable people and things all have birthplaces.